Prominent & Leading Manufacturer from Chennai, we offer acme number locks and mortise door handles. We are successfully ranked as the top trader and supplier of ACME Number Locks. The offered number locks are used for security purpose in various residential & commercial areas. These number locks are manufactured at vendors end by utilizing finest quality material and leading technology. Our honored patrons can avail the offered number locks from us in customized options at their budget. 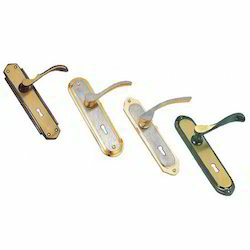 For fulfilling the diverse needs of customers, we are offering a qualitative array of Mortise Door Handles that is easy to install, & also provide easy to & security in various places from its locking, the offered door handle is precisely manufactured by optimum grade material under the keen observation of accomplished professionals. Additionally, to remove flaws our quality controllers check this door handle on quality parameters.